Pub premises on the corner of Tamworth Road and Tamworth Place, vacant as of May 2017. It closed down in June 2015, with a notice in the window photo reading "Closed Due to unforseen [sic] circumstances until further notice". 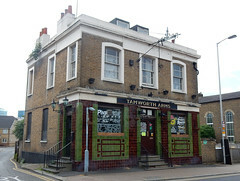 The beer garden and surrounding land were later built on to provide housing photo, though the pub itself survived. Last edited 2017-12-11 11:44:39 (version 12; diff). List all versions. Page last edited 2017-12-11 11:44:39 (version 12).